Details: 4 BR, 4.5 BA beachfront residence with 3,700+/- s..f. - $1,275,000. 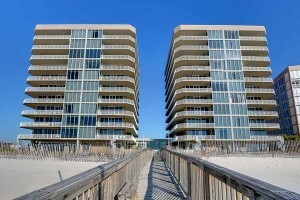 Mediterranean condo for sale in Perdido Key FL. Exceptional views of the Gulf of Mexico, Ole River and Ono Island from this gulf-front resort home - the huge private balcony great for watching sunsets and entertaining family & friends. This unique condominium has extra dining space with 2 separate dining areas, 2 breakfast bars and a wet bar complete with wine cooler, ice-maker and sink. The floor-to-ceiling windows throughout prove an abundance of natural light, direct balcony access from each room, travertine flooring in the living areas - freshly painted in neutral tones. You will love entertaining from this well appointed kitchen equipped with double-ovens, subzero refrigerator, plenty of cabinet space, granite counter-tops, and a new dishwasher. Large master suite has a sitting area overlooking the beach, ideal for a morning coffee or an evening cocktail. The master bath has steam shower, jetted tub, marble topped double vanities and walk in closet. The other 3 spacious, en suite bedrooms have water views and direct balcony access for watching dolphins, para-sails, boats.